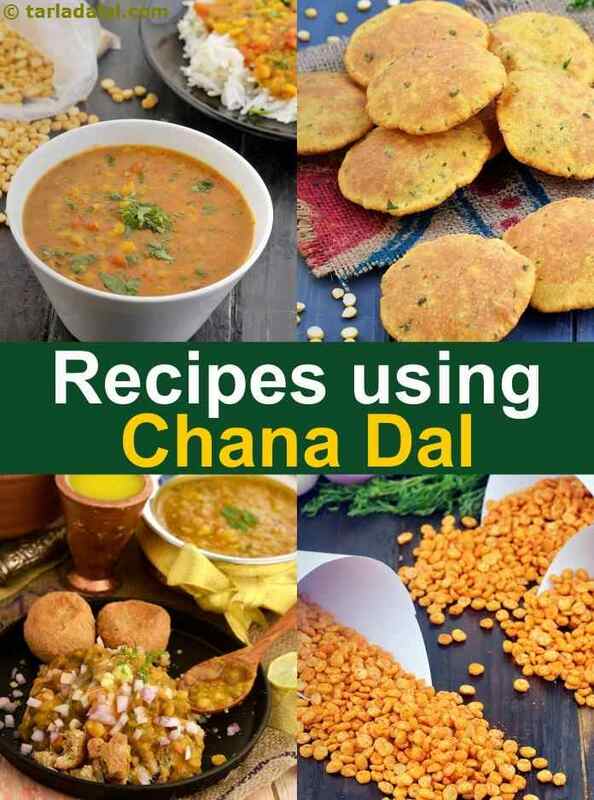 chana dal recipe collection. begal gram recipes. Bengal gram, which are just baby chickpeas chickpeas, is a yellow lentil that has been split and polished. They have a sweet, nutty taste. They can be roasted and powdered to make chickpea flour (besan) and are widely used in Indian cuisine to make an array of dishes. It is a versatile ingredient. It is widely appreciated as health food and a rich source of proteins for cereal-based diets. It also helps in lowering the cholesterol level in the bloodstream and is also good for diabetic patients as it has a low glycemic index. This lentil is used extensively in India in all its forms, especially in snacks. Ranging from simple yet delectable recipes like Chana Dal Pancakes that are flavored with methi and ginger to more complicated ones like the Fried Chana Dal, a specialty found on the streets of India. Chana dal is also an essential ingredient of all the chutneys we eat along with our South Indian Delicacies. Mysore chutney, a spicy, garlicky, chana dal accompaniment, is the ideal thing to have with idli and dosas! The great thing about Chana dal is that it tastes great in a wide range of dishes including salads, curries, tikki etc. Qabooli biryani is a flavorful, aromatic, spiced, slow-cooked biryani layered with Chana dal. It is a filling meal, rich in protein and fiber. Who doesn't love dal Vada? This crispy, Chana dal Vada are the perfect tea-time snack. Got some boiled leftover dal from last night? How about stuffing them to make delicious Dal paratha?! This popular Maharashtrian delicacy, Puran poli is a sweet made by stuffing Chana dal mixture to wheat flour and is widely made during Ganesh Chaturthi and Diwali. If you want to know more about the Uses of Chana Dal, then you can check out our article on that. A simple yet hearty dal with the goodness of fresh crunchy cucumber. A quick-to-dole-out recipe, so if you are late from work and craving for some piping hot dal, try this one out. It won’t disappoint! An unusual combination of flavours and ingredients creates a sumptuous snack that is sure to tickle your taste buds. Makes a great burger filling too. Yam or suran combined with chana dal and a mélange of spices makes an interesting seekh kebab that tastes fantastic.